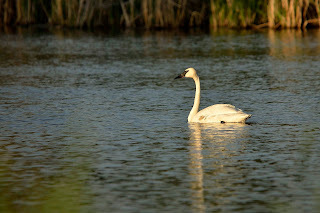 I went out riding my Triumph last night - and happened to see this swan in this little pond about 12 miles from my home. Of course I do not have my camera with me because I am on my bike. So I head home to get it. Fortunately he was still there when I got back. There was also three guys trying to shoot carp with a bow and arrow, so the swan was now a little shy. They left and the swan came back in view. This time it did not matter a whole lot (except for 28 mile round trip) but tonight on the way home from dinner I spotted a fox sunning itself on the edge of some woods. I was only a mile from home. So off I went to get my camera. Came back and it was gone. Always keep your camera with you.